The apartment is in a fully renovated house. Modern, clean, spacious, with a terrace, helpful staff and within walking distance to the most relevant Seville sightseeing spots. Really great! We were welcomed by the wonderful Pedro. Nothing was an issue, so helpful! The property was perfect, location, cleanliness and incredibly safe! We will be back! The property is set in a historic building in the old part of Sevilla within walking distance of many sights. The staff was very welcoming and responsive. Because we were unable to get to the property before 8:30pm we were charged an extra 18€. When I gave my credit card details when booking the property took well over half. They notified me of their “mistake “ and asked if I wanted to reverse this payment. I did decline, but a bad mistake on their part. Beware. The appartment was comfortable and well equipped. The complex has a nice patio. Check in was amazing. Staff waited for us even though our plane was delayed and we ran quite late. They were really patient and understanding as i was quite anxious about our late arrival. They really were brilliant. I can't thank them enough and they all gave different and excellent recommendations for food, shopping, nearby markets etc, giving us a real honest connection with the area. I loved the comfort of the apartment, it was clean, spacious and well stocked with everything you needed. The beds were comfortable, the double bed was too hard for my taste, we took the mattress from the sofa bed which we were not using and made a pillow top for the bed, problem solved. It felt like home. It is a great location with restaurants and markets close by. I will recommend and returned to this apartment on our next visit to Sevilla. Love it. Apartment was big with a kitchen, living room, bathroom, and bedroom. Bedroom was large with plenty of space for our luggage and clothes. Lots of restaurants in the nearby area. Lock in a great price for Apartamentos La Casa del Pozo Santo – rated 8.6 by recent guests! Apartamentos La Casa del Pozo Santo This rating is a reflection of how the property compares to the industry standard when it comes to price, facilities and services available. It's based on a self-evaluation by the property. Use this rating to help choose your stay! One of our best sellers in Seville! Housed in a traditional Seville house from the 18th century, these apartments offer an authentic experience of timeless Andalusia. La Casa del Pozo Santo is built around a typical shaded courtyard of marble columns and wooden beams. Ideal for independent families or groups of friends, each apartment has a well-equipped kitchen and state-of-the-art amenities such as plasma-screen TVs. The property is located on a pedestrian street in the center of the city, near the main shopping area. Many central sights of the Andalusian capital, such as the gigantic Cathedral with its emblematic Giralda tower, are just a short walk away. 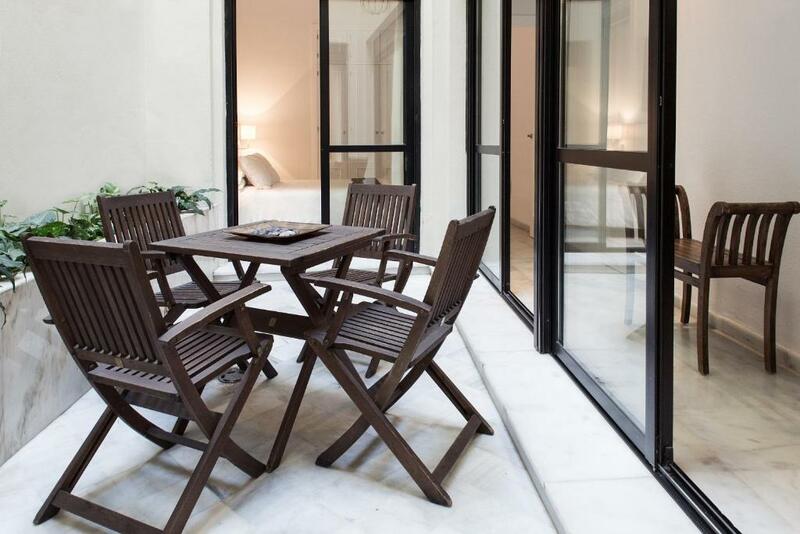 뀐 Located in the real heart of Seville, this property has an excellent location score of 9.0! 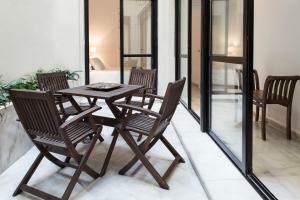 When would you like to stay at Apartamentos La Casa del Pozo Santo? This characteristic Sevillian apartment comes equipped with a double bedroom, living room with a double sofa-bed, a bathroom and a dining room. There is a modern fitted kitchen, a flat-screen TV and free Wi-Fi. Towels and bed linen are included. Extra guests may use the sofa bed for an additional fee of EUR 30 per night. This characteristic Sevillian apartment is suitable for up to 4 guests. It comes equipped with 2 double bedrooms, a living room with double sofa-bed for a fith or sixth guest (see hotel conditions), bathroom and a dining room area. All cookware and crockery is also provided in a modern fitted kitchen. The lounge area includes a flat-screen TV. Towels and bed linen are included and Internet Wi-fi access for free. This typical Sevillian apartment comes equipped with a double bedroom and a living room with a double sofa-bed for the 3rd or 4th guest. A complete bathroom and a dining room area are included. All cookware and dishware is also provided in a modern equipped kitchen. The lounge area features a flat-screen TV. Towels and bed linens provided and Wi-fi internet access for free. This typical Sevillian apartment comes equipped with 2 double bedrooms and a living room with a double sofa-bed for the 5th or 6th guest. 2 complete bathrooms and a dining room area are included. All cookware and dishware is also provided in a modern equipped kitchen. The lounge area features a flat-screen TV. Towels and bed linens provided and Wi-Fi internet access for free. Our apartments are located in the very city center, in a historical building that makes you feel like real andalusian people. Come and take a look! House Rules Apartamentos La Casa del Pozo Santo takes special requests – add in the next step! Apartamentos La Casa del Pozo Santo accepts these cards and reserves the right to temporarily hold an amount prior to arrival. A little more soft furnishings in the salon to make it more welcoming Better and brighter lights for reading. Nothing at all, we really had no complaints. Very clean and spacious apartment with everything we needed. Excellent location. Lovely hosts. Car parking was a nightmare!!! Very narrow streets like rabbit warrens. We eventually parked quite a distance away and walked back. Wish we had done that first before attempting to drive to the property! Lovely apartment with everything you would need. Little welcome tea/ coffee etc a very nice touch. Didn’t expect a bar so close to our property but it didn’t stay open late so wasn’t really a problem! 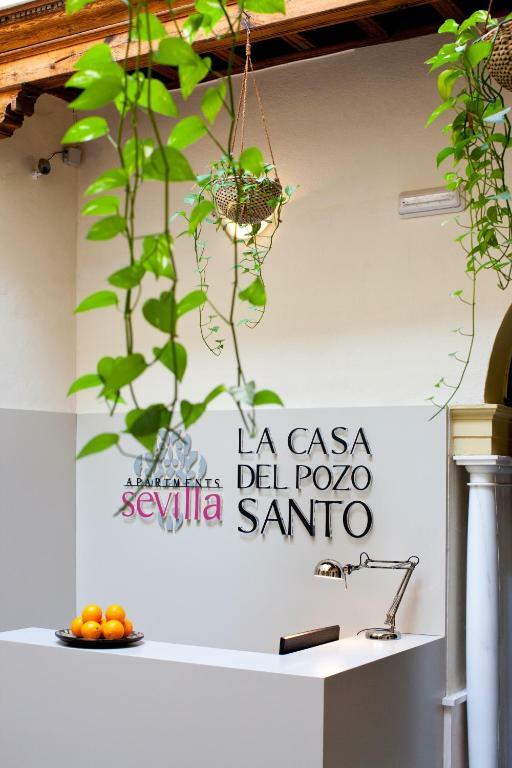 In general our stay at Apartamentos La Casa del Pozo Santo was acceptable. It was clean and had the facilities we required. One point did detract from our stay. Upon booking our room, which was several months prior to our visit, we requested, if possible, to have a quiet room. We understood it was only a request and couldn't be guaranteed. After all we were staying in a city and not an isolated countryside hotel! Upon arrival we were allocated a room and we asked if our request had been taken into account as it was on the ground floor and within the reception area. We were told it was a quiet room. Unfortunately this turned out to be the case as four meters from our bedroom window was a lively Tapas bar with many of its occupants being outside in the narrow street well into the night. There are three rooms on the ground floor and no doubt all three are affected. The overall location was good with the furthest area we walked to was the beautiful Plaza de España, which is one of many sights worth planning for and visiting. Seville itelf is a vibrant city and we were delighted to see how clean it is kept. Location. Pila at reception was very friendly, helpful and efficient in organising any requests we had. We arrived by bus, it would be helpful if there was a more detailed map with street names to get you to the property. Our apartment had no outside windows. The building had a central courtyard which allowed light in through very large windows, unfortunately it also allowed people in the apartment above to see us in our apartment. we had to lower shutters for privacy. No heating. Located close the City centre, local shops/cafes nearby. Friendly staff. Clean & Tidy. Good kitchen. We stayed in an apartment on the ground floor, and it was quite noisy. Sorry for the unpleasant detail, but you can clearly hear every single noise from the upstairs bathroom. Plus, an unfortunate coincidence, outside the grocery store in the street facing our bedroom there was a group chatting loudly until late. The furnishing is a little dull (but one chair) and it would not take much to make it a little bit more pleasant. The worst for us was the lighting: in the living room it was depressingly dim and in the bathroom was not sufficient. The first thing to say is that the staff is super efficient and very kind. The price for a flat in this location (15 min walk to the cathedral) is extremely convenient, quite a bargain if you look for this kind of facilities. The patio is lovely and so is the whole restoration of the building. Mind you: it is difficult to find, google map does not help, so print out the maps they kindly send you by email. Students staying on our final night were very noisy. We had to get out of bed on two occasions in order to request that they kept the noise down. This was at 23.30 and then again at 00.30. This was not the fault of the apartment owners however they perhaps need to be aware of the possible effects on other guests of booking students into the apartments in future. Receptionist was on duty so could answer all our questions as we as hand over the keys.